B&B ”Bij De Tijd” is a complete independent apartment in the centre of Gorinchem. With a lot of luxury. It is build in a old house (1865) with the comfort from a modern house. Originally it was a storage. We build it by ourself and with help from friends to this apartment in the late hours after our work. We are open since late august 2015. We have had a lot of guests. Airbnb has given us 8 times in a row the rank of super host. 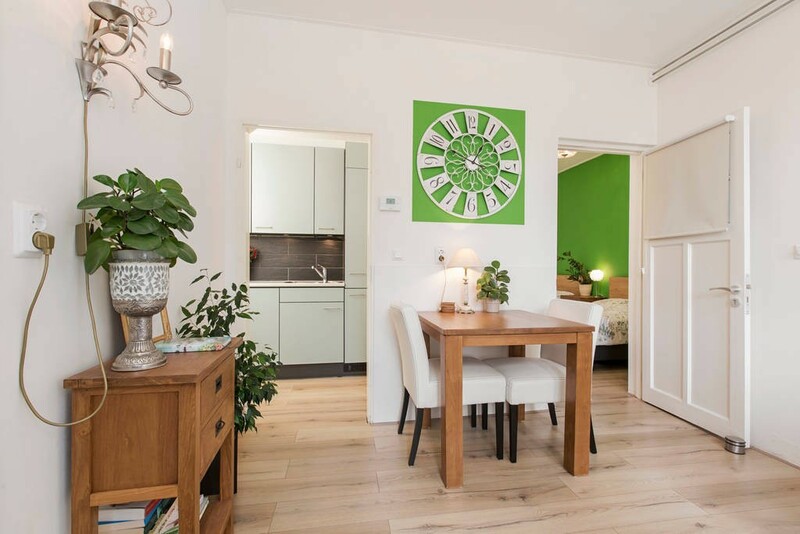 So we are proud of our apartment ”Bij De Tijd” and hope you will like it to. The apartment is for one or two adults available for the stay of one or more nights. The apartment has their own livingroom, bathroom, kitchen, bedroom and entrance. The kitchen has all the necessities for cooking a nice or simple meal. There are also towels, refigerator, freezer and a oven/microwave. In the bathroom you will find a hairdryer and toiletpaper. In the bedroom you wil find towels, linen and two separate beds for one person. Beds can be placed next to each other. In the livingroom is a couch, table with two chairs and a widescreen TV. There is free WiFi in the apartment. In the entrance there can be placed two (small) bikes. No electric bikes aloud. The price for one person per night is 60 euro exclusive breakfast. Two nights 55 euro. You will pay for breakfast 10,00 euro p/n. The price for two persons per night is 70,00 euro exclusive breakfast. Two nights 65 euro. You will pay for breakfast 10,00 euro p/n. Breakfast is fresh and will be an raw egg, fruit, bread, cheese, meat, diverse sweet, orange juice, milk, tea and coffee. The breakfast is in the refigerator and in closed pakkage in the apartment. The more days you will stay the lower the price you paid for breakfast. Gorinchem is a small and cozy village. There is a lot to do or to see. You can walk on the ramparts of Gorinchem. There are several beaches nearby and you can make a boattrip to the villages Woudrichem, SLot Loevenstein and Vuren. By bike or walk you can see a lot of beautifull nature. Shops, restaurants and musea are nearby at least at 10 minutes walkingdistance from ”Bij De Tijd” . Train station at 15 minutes walkingdistance from ”Bij De Tijd” . The Busstop at 1 minute walkingdistance from ”Bij De Tijd” . We want to give our guests a lot of privacy. We only can guarantee that if guests live by our houserules. The apartment is clean, cosy and still looks brand new. We need your help to keep it that way! Be good for the apartment and all the stuff. Use everthing for where it’s ment to be used. Put coats on the coatrack. Not on couch or chair. Suitcases not on an unmade bed. We are a bed and breakfast with the luxury and comfort from a independent apartment. Parties and other noisy activities are not aloud in and outside the apartment. No harddrugs, drunkenness, prostitution or smoking are aloud in the whole apartment. Bikes can’t be placed in other rooms than in the entrance. No pets are aloud in the apartment. During the day you will leave the curtains open for our plants. You can use the roller blind for more privacy. When your not in the appartment you will put the radiator on 18 degrees. *Please tell us when something is broken or missing! By making a reservation you will give your Phonenumber and your whole name. You can use our Reserveringsformulier! Incheck time and outcheck time is in consultation and also depends on reservation before or after your stay. There will not be negotiate when your stay is shorter than 2 week about the prices. You are aware that we have a B&B and not a room rental business. You paid the exact amount charged by arrival (there is no pin) or you pay by bank at least a week before arrival, when your stay is longer than 7 days. When you have an allergy for something or something else wich is important for your stay to be safe tell us about it before you make the reservation. When you make the reservation you agree and read our house rules and general rules. By misbehavoir we end your stay directly and for free. The car can be parked in the Kazernegarage. You pay 1.60 euro per hour. Attention: parking the car outside the garage you have to pay till 22:00. There are no parkingspots for free in the centre of Gorinchem. For other or more information of ”Bij De Tijd” you can ask us by phone or mail (see contact). Pictures you will find by foto’s. 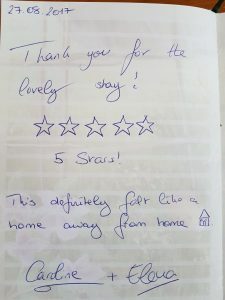 More reviews can be found by airbnb. Best regards Jasper & Mina and we hope to see you soon!